A plethora of players of all sizes is what makes the global antimony market increasingly competitive, finds Transparency Market Research (TMR). Large, prominent players are facing ceaseless competition against small- and medium-scale players to retain their leading shares. In recent years, large-sized companies in the antimony market have bolstered their positions by investing substantially in research and development activities. In the coming years, they are likely to focus on leveraging the potential of acquisition of regional players to consolidate their geographic footprint, which also might help them to hold their sway in the global antimony market. However, TMR observes relatively several small players enjoy stronghold in the market with their large customer base, which they will try to expand further. These measures, on the other hand, may be countered by big players who mull entering into strategic alliances in the global antimony market. Some of the top players operating in the global antimony market are Nihon Seiko Co., Ltd., AMG Advanced Metallurgical Group NV, United States Antimony Corp., Seiko Co., Belmont Metals Inc., and the Future Interfaces Group. 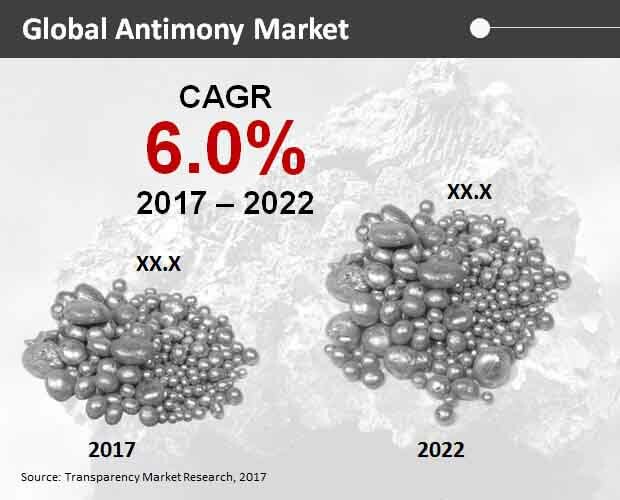 The global antimony market is projected to expand at a promising CAGR of 6.0% during 2017 – 2022 and reach a worth of US$2000 million by the end of this period. Among the various end-use applications of antimony, flame retardants and lead-acid batteries jointly are expected to hold major share in the global market throughout the forecast period. Though the former segment holds a major share, the later one is forecast to rise at a higher CAGR during 2017–2022. This is attributed to the burgeoning application of antimony in the battery industry. On the regional front, Asia-Pacific excluding Japan (APEJ), held the major share, vis-à-vis sales revenue, in the global antimony market in 2017. The region is expected to retain its lead until at least 2022. The extensive use of antimony in various applications is expected to fuel this regional market throughout. Antimony, since decades, has fascinated end-use industries owing to several unique chemical properties which propels its use in numerous commercial applications. This is a key factor that had led to the rapid evolution of the antimony market over the past years. The antimony market is increasingly driven by its rising use in the production of alloys and as a constituent in several commercially useful materials such as in pigments and flame retardant-fabrics. The extensive use of antimony in the production of lead-acid batteries is a notable trend accentuating the market. The rapid strides taken by the battery industry in the various parts of the world riding on the back of expanding automotive industry is a significant factor boosting the global antimony market. The high stability of antimony underpins its remarkable chemical compatibility, which is bolstering its use as constituent in alloys and inorganic compounds of better stability. The profuse use of antimony is the production of antimony trioxide to improve its flame-retardant properties is catalyzing the commercial application of antimony. In addition, the rising application of antimony trioxide in the manufacture of ceramics, rubber, glass, and plastic. However, the growth of the antimony is beset by the considerable adverse health effects of antimony. Moreover, environmental hazards related to the use of antimony has resulted in several regulatory curbs in numerous countries, thus acting as a bottleneck in the market growth. Nevertheless, manufacturers, especially in developed nations, are spending sizeable sums in research and development to evaluate the toxicity profile of antimony and develop its better applications. This is a key factor expected to unlock several lucrative prospects in the antimony market in the coming years. Furthermore, large investments to procure antimony mines in regions such as Europe and North America is also expected to catalyze the expansion of the antimony market. The study presented here is based on a report by Transparency Market Research (TMR) titled “Antimony Market (End Use - Flame Retardants, Lead Acid Batteries, Heat Stabilizers and Plastics, and Pigments): Global Industry Analysis, Size, Share, Growth, Trends and Forecast 2017–2022”.